Samsung has launched Australia’s first QLED 8K TV, but it comes with a hefty price tag of up to $17,500 – and there’s actually no 8K content to watch on it yet. 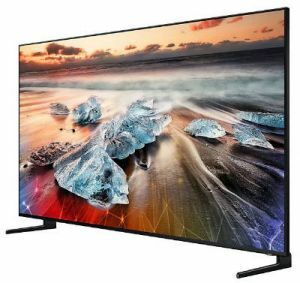 Pre-orders for the Samsung 2019 Q900 QLED 8K television range opened on 14 March, before it officially hits stores nationally on 1 April. Those who pre-order any Samsung QLED 8K TV from Samsung’s online store will also receive a bonus Samsung Galaxy S10+ smartphone, valued at $1,499 (RRP). Samsung says its QLED 8K TV breaks new ground in its ultra-premium TV and home entertainment offerings, supported with its most advanced picture quality yet. The Q900 range will be offered in 82-inch, 75-inch and 65-inch screen sizes, aimed to meet Australia’s demand for larger screen formats. Jeremy Senior, Head of Consumer Electronics at Samsung Australia, said: “Samsung’s first QLED 8K range reinforces our commitment to delivering the best possible viewing experience for our customers. “Samsung’s QLED 8K offering will set a new standard in what Australians will expect from our ultra-premium offering in home entertainment and is truly something you need to see to understand. “Australians are buying bigger TVs each year and with a larger screen size comes the need for a clearer, more detailed picture. Samsung QLED 8K technology delivers our best possible viewing experience for the large screen format. The Samsung QLED 8K TV comes with AI Upscaling technology stated to use the power of machine learning to analyse and upscale content to 8K resolution. The 8K Quantum Processor is stated to recognise and upscale all content whether through a streaming service, set-top box, HDMI, USB, or even mobile mirroring. 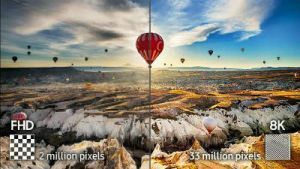 Samsung notes that there’s “very limited” native 8K resolution content currently available, and in turn, the upscaling it performs will vary depending on the quality and resolution of source content. The Samsung QLED 8K integrates HDR10+, Ultra-Bright III and Direct Bright III technology to manage the TV’s contrast and colour. HDR10+: stated to minimise the impact of glare and reflection in many of Australia’s sun-filled rooms. Ultra-Bright III: claimed to allow you to see extra detail in virtually any light. Direct Full Array Elite III: boasted for Samsung’s deepest black levels yet, combining direct LED backlighting and anti-glare technology to precisely adjust brightness, black levels and enhance contrast. One Clear Cable: an all-in-one clear cable that frees TV space from unsightly cords. By combining the optical cable and power into one thin, five-metre cord, it aims to offer more freedom to decide where and how to place the TV. Ambient Mode: displays art, photos or time and weather on stand-by mode to suit a room’s interior décor and design. You can also take a picture of the wall, so that it blends in seamlessly. Smart TV enhancements: control your TV via Smart Things, Bixby, Google Assistant, Amazon Alexa or Apple AirPlay (coming soon). One Remote Control: control a range of compatible devices with one remote and get quick access to things like Netflix, YouTube, Xbox or a compatible Soundbar. How much do Samsung’s 8K QLED TVs cost? Samsung’s largest 8K QLED model costs $17,499, while the 65-inch variant will set you back just under $10,000. 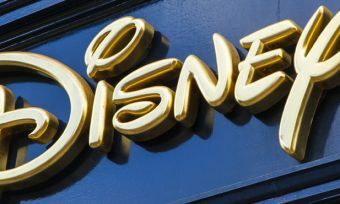 If you don’t mind splashing out the cash, perhaps the extra software features will enhance your TV viewing experience for your next Netflix marathon. And don’t forget to invite your family and friends! Samsung will announce further information regarding its 2019 TV range, including its 4K QLED and UHD TVs, in early April.